Breast implants are used in breast augmentation surgery and breast reconstruction surgery to improve the appearance of the bust line. Different types of breast implants are available to suit your physique, lifestyle, and aesthetic goals. Dr. Jason Potter is an experienced, double board-certified plastic surgeon who can help you choose the right kind of breast implants to achieve the results you desire. At his Dallas, TX, practice, Dr. Potter meets one-on-one with patients to carefully explain breast implant options and answer any questions. Contact us today to set up your personal consultation with Dr. Potter. The two most common types of implants are saline and silicone. Composed of a silicone shell filled with sterile salt water, saline implants are approved for breast augmentation patients ages 18 and over. These implants provide enhanced breast size and shape, and in the event of a rupture, the solution is harmlessly absorbed into the body, making revision surgery relatively simple. Because saline implants can be filled following placement, they require only a small incision. Meanwhile, it is important to understand that saline implants can result in a rippled appearance in the breast, which is why they are usually recommended to patients with ample natural breast tissue. Silicone implants are filled with viscous silicone gel, which many women believe provides a more natural look and feel. Because they must be filled prior to placement, they require a larger incision. 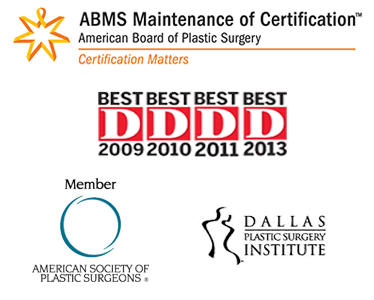 They are approved for breast augmentation patients ages 22 and up. Breast implants can be round or teardrop-shaped. Round implants produce a fuller look in the upper breast, and if they happen to shift, it will not affect the appearance of the breast. Teardrop-shaped implants slope downward for a more natural look, but they can distort the shape of the breast if they move out of place. Saline and silicone implants can be either smooth or textured. A smooth implant can move freely inside the breast pocket. Textured breast implants achieve a degree of traction within the breast pocket to resist movement. All teardrop-shaped implants are textured. Implants can be inserted either below the pectoral muscle (submuscular placement) or above (subglandular placement). While submuscular placement produces what many patients feel is a more natural appearance, subglandular placement can produce more voluptuous results. If you lead an especially active lifestyle, subglandular placement may be the best option for you. During your consultation, Dr. Potter will make a recommendation based on your goals, lifestyle, and body type. He will take time to answer all your questions so you can make an informed decision. Breast implants can give you an enhanced figure and boosted confidence. Choosing an excellent surgeon is the surest way to achieve the results you desire. Dr. Potter is a board-certified plastic surgeon with a track record of providing patients with outstanding long-term results through breast surgery. To schedule a personal consultation with Dr. Potter, please contact us today.